A four-letter word with multiple meanings is game. When I say, “I’m game,” I want to be included. You can eat game animals that live in the wild and are hunted for food or sport. Little kids love to play the game of hopscotch. Twenty-one is a gambler’s card game. The Lakers’ play-off status will be determined by winning more b-ball games. To play a game on someone can be tricky. You can be ahead of the game in Words With Friends (WWF) when you outscore your opponent in a game with rules that determine the winner. Zynga developed WWF in 2009 as an app for gamers to play on iPhones, iPads, Android Windows phones and other tablets, even Facebook. A take-off from Scrabble, with similar words and rules, each player has seven letters with different point values. A game of chance with letters randomly assigned, a bit of strategy comes into play. Ever heard of these two-letter words with big-point first letters? J, Q, X, Z make JO, QI, XI and ZA. I’ve never bothered to look up their meanings. They work to the max on triple-letter and word spots. Lots of fun, keeps those brain cells stimulated and brings on a challenge. Win or lose, it’s a game. I lost twice in a row to this guy. Decided to challenge him for a third round. There’s a “chat” feature to say anything you want, for a high word score, or to sound off at your opponent. Smart aleck thought he’d intimidate me, saying that he gets paid for wins from WWF, $50 on that second one. Guess who lost the next round? Hope his cache was less when he opted out of another round. Seventy-plus Fred Yoshiwa’s definitely got game. This guy knits and crochets, and he’s darn good at it. Spends six hours a day doing this. 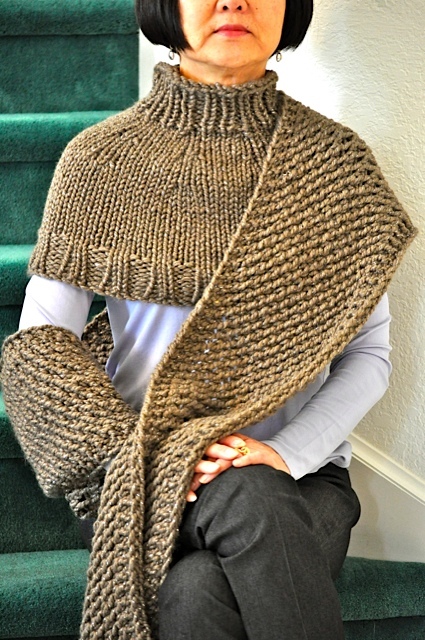 A camel wraparound scarf shawl tinged with metallic threads in a knit/purl technique comes from Fred Yoshiwa. 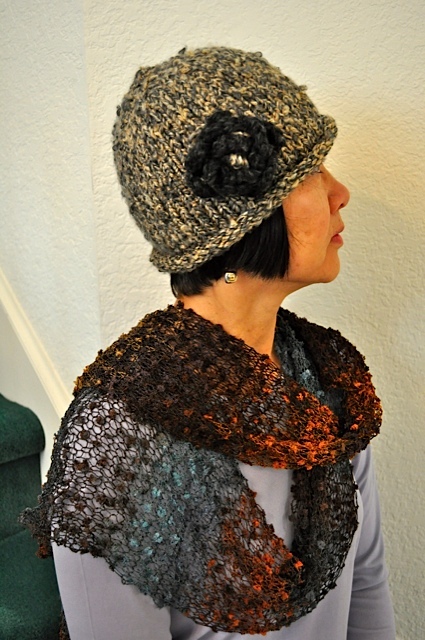 Local yarn shops and artisans who dye and spin their own yarns are readily available in SoCal. Japan and Turkey are also good resources. Who knew that many manufacturers have their yarns made in Turkey? Yoshiwa thrives on finding new fibers made from wire, banana, soy, yak, fine linen and various combos as well as wool, cotton, acrylic and nylon. Reason enough for having 12 very large plastic containers chock full of yarns. His foray into the fashion industry started at downtown Bullock’s (now Macy’s) as an assistant buyer in the ’60s. At Trade Tech, he learned everything you always wanted to know about pattern making, draping and fashion illustration that landed him a top job geared to young fashionistas. See his collection along with other artisans and craftspeople at the So-Phis Fashion Show at the Anaheim Hilton on March 23. Early birds get there at 9:30 a.m. when boutique doors open. No ticket required to go shopping. Saturday, March 23, 9:30 a.m.-4 p.m.
Sunday, April 28, 9:30 a.m.-4 p.m.
Sunday, May 5, 10 a.m.-3:30 p.m. I am a consultant for Thirty One Gifts. Would love to get my info out to the Japanese community. Thank you for referring me to this site. I loved your article about Fred Yoshiwa. He is amazing. Did he happen to mention his superlative skills in the kitchen arena? Truly a creative person! Thanks for reading! So, Fred is also a chef, huh? And a super-generous guy who cares about others! Loved the article on Fred. He’s a terrific talent and a terrific chef! His knitted pieces are remarkable. I am lucky enough to own a scarf. Everyone needs to see his work. Buying it is also a good idea. Its like buying art.